A relaxed hotel at a 10-minute walking distance from the city center, Angela Corfu Hotel is the perfect destination for tourists seeking some modern amenities and peace. Guests can relax by the leafy beachfront property or just soak up some sun in the lounge chairs at the sun deck. The hotel consists of 12 buildings and 4 luxe swimming pools. The direct access to the beach is one of the main highlights of this resort. 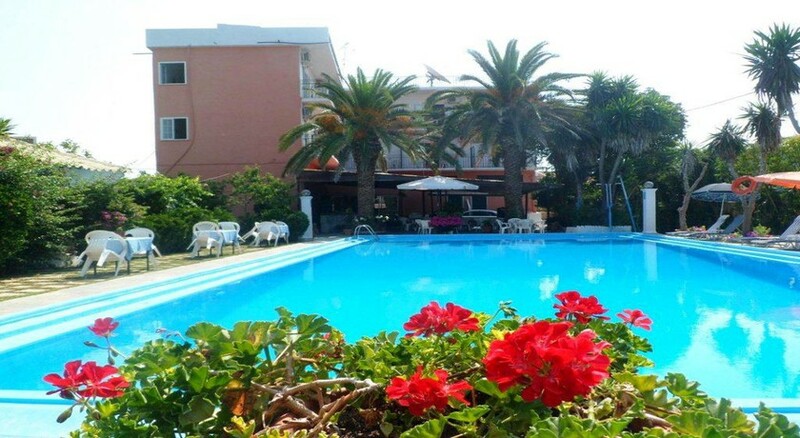 A quaint little place with beach access, Angela Corfu Hotel assures complete relaxation. The inviting outdoor pool is well-maintained and the guests can enjoy a trip to the city centre with the complimentary local shuttle offered here at Angela Corfu Hotel. There is free wireless internet available at all public areas. 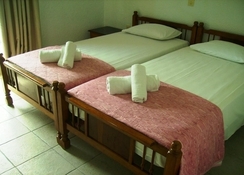 The hotel is run by a family and has a pleasant ambience and atmosphere around. The lovely Astrakeri beach, where the hotel is located is on the northern shore of sun-soaked Corfu, known for its shallow and crystal-clear waters. The resort is situated between tourist resorts of Roda and Sidari. There are excellent bars, restaurants, public conveniences and water sports facilities located nearby. 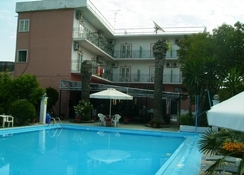 Angela Corfu Hotel is just 5 km from the Folklore Museum of Acharavi and just 37 km from the Corfu International Airport. Located directly on the pebble beach in Astrakeri, guests can visit Roda at 4 km and Acharavi city at 6 km from here easily. Corfu city is located at a distance of 41 km from here. Guests can also visit the supermarkets at 3 km, disco at 4 km and the bustling Corfu town at 40 km. The rooms at Angela Corfu Hotel come equipped with balconies or terraces. They are quite simple and yet elegant. 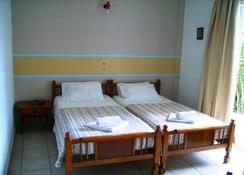 Guests can enjoy internet access and satellite TV in the rooms. The rooms also have mini fridges and air-conditioning. The upgraded rooms offer sea views. Family rooms have a capacity of fitting in 4 people. 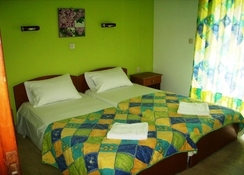 A very welcoming and friendly staff keeps the rooms neat and tidy. At Angela Corfu Hotel, a sumptuous continental breakfast can be enjoyed daily in the dining area. A casual buffet restaurant with a covered terrace serves lip smacking delicacies here. Greek and Mediterranean dishes are quite famous here. Guests can also enjoy some drinks at the lobby bar or relax with alcoholic thirst quenchers by the poolside. There are plenty of bars and restaurants close to the property. One should also try the traditional taverns at walking distance from the property. A fresh water swimming pool is one of the main highlights of the property. Children can entertain themselves at the playground made exclusively for them. Guests can park their vehicles in the parking lot. The hotel also features a TV lounge for entertainment. The hotel arranges for a taxi transfer on prior request.